While I was distracted with my late wife’s illness, Script Debugger’s 20th anniversary came and went. Development on Script Debugger 1.0 started in 1993. Version 1.0 was released in late 1994 and was introduced publicly at MacWorld in San Francisco in January 1995. We shared a booth with FrontMost (later renamed FaceSpan) by Software Designs Unlimited. Here’s how Script Debugger looked back then. Interestingly, Script Debugger 1 may never have been a product. I was very uncertain about how to market and sell what was really a $129 piece of shareware. BBEdit was the only model of how this could be done by an independent developer. Remember, the Internet was not as it is today. Software was shrink wrapped in boxes containing floppy disks and printed manuals. It took serious cash to produce product. I had 2000 copies made at a cost of CDN$20,000 (1994 $s). The packing boxes filled an entire room in my basement. Software was sold through mail order outlets (MacTech, Apple’s Developer Central, and others) and trade shows like MacWorld and WWDC. The Mac had no presence in computer stores at that time. I vividly recall standing outside the MacTech booth at WWDC 1995 in San Jose watching people walk up and purchase Script Debugger. I just could’t believe it was actually happening after all the work that had gone into getting those shrink-wrapped packages onto the MacTech shelves. I developed such an appreciation for how things as mundane as a can of soup get onto a store shelf. Our daughter was born in 1995, and Gerry left her job to work full time with me. We were so naive. We had no idea what we were signing up for. Script Debugger 2.0 was introduced in 2000, and went on to win the Mac World Eddy for best development tool (we were up against BBEdit that year – I think Rich and the guys promised Gerry a bottle of champaign – I was at home looking after our 4 year old daughter). I was bummed because I later discovered the presenter that year was John de Lancie who played one of my favourite Star Trek Next Generation characters “Q”. The big advancement in Script Debugger 2 was the object model explorer which let you see an application’s live scripting interface. This was huge at the time, and to this day, sets Script Debugger apart. After Script Debugger 2 was released, Apple had its near death experience and our business simply stopped (literally went to zero) in the space of 3 weeks. During the period that followed, we developed an Adobe Illustrator plugin that made Illustrator scriptable from the Mac with AppleScript and from Windows with Visual Basic. Adobe later purchased this code from us and this went on to form the genesis for the scriptability found in Illustrator, PhotoShop and Acrobat (InDesign had its own killer scripting implementation before we arrived on the scene). The product, named ScripZ, was demoed by Sal Soghoian at that year’s MacWorld Jobs led keynote. We were in meetings with Adobe to conclude the sale of the software right behind the black curtain beside the stage as the keynote was taking place – crazy. 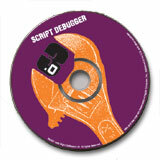 In 2002 we released Script Debugger 3.0. Script Debugger 3 had pretty much the same look and feel as 2.0. We went on to be the runner up for that years MacWorld Eddy for best development tool (I think CodeWarrior got it that year). 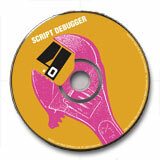 In 2006, Script Debugger 4.0 was released. 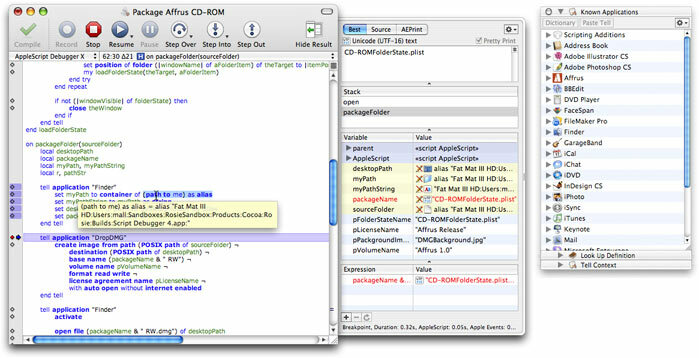 Script Debugger 4 became a Cocoa/Objective-C/C++ application (previously it was a THINK Class Library/C++ application) and received a UI overhaul which adopted the Mac OS X look and feel, and introduced concurrent script execution where scripts open in different windows could be debugged at the same time. Then in 2009 we released Script Debugger 4.5. Like Script Debugger 3, this was an evolutionary released which built on Script Debugger 4. While I did all the development on Script Debugger, it was not me alone. Gerry was there throughout the ups and downs running the business, executing the marketing and sales plans. She and I worked together in the same office for most of these 20 years. Matt Neuburg has been there throughout producing all our documentation (amazingly taking over from our first tech writer and creating the SD1 manual in 3 weeks!) and serving as my sounding board for so many years. Other lesser known individuals include Frances Hunter (she produced the original Script Debugger 1.0 printed manual), Lorin Rivers doing marketing and Bryan Bell did all the icons starting with Script Debugger 3. Adrian Ruigrok developed much of FaceSpan 5 and went on to work for Apple on some of the cool iThingies we all love today. And of course the invaluable support of other developers like Rich Siegel, Jon Pugh, Stephan Somogyi and many many others. And finally, there are all the relationships that developed with customers through all these years, many dating back to the initial release of Script Debugger 1 (Shane, Ray, Jon, Chuck). Wow, 20 years of my life involved in developing Script Debugger. My daughter is 19 now and attending college. I hope I have all these dates more or less correct. The impetus for Script Debugger came from difficulty I experienced trying to automate Claris FileMaker and Claris MacProject Pro using Apple’s Script Editor. Oddly, these two Claris applications were very scriptable at that time. Script Debugger 1.0 easily fit on 1 800K floppy disk. Script Debugger 5 is a 14MB download. Script Debugger was ported from Think C/TCL/C++/Classic Mac OS Toolbox to Symantec C++, then to CodeWarrior, then to Carbon on Mac OS X, then to Cocoa/Objective-C using Project Builder and now Xcode. Along the way, the TCL (Think Class Library) had to be ported to Carbon. Parts of the TCL are still in use in Script Debugger 5 (CFile/CResFile/CDataFile). Script Debugger has out lived several of the products used to build it (THINK C, Symantec C++ and CodeWarrior). Only BBEdit continues to flourish. Amazing journey; thanks for compiling the details. I bought SD1 in 1999 and can only wonder why I waited until then. Script Debugger has given us scripters an amazing boxful of tools. 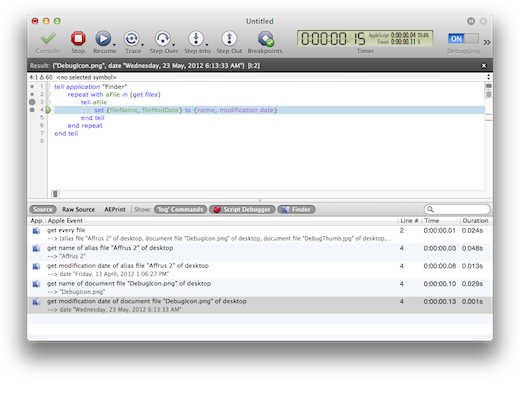 Debugger turns the miserable drudgery of coding without it into predictable and peaceful productivity. For me, that transition came in 2002 in the form of SD3. I am (and all other Debugger users are) deeply indebted to you, and to Gerry, Matt, and the rest of your team, for your relentless pursuit of excellence. Thank you, Mark! Using it on a daily basis way back from version 2! Thanks Shane! Mark, I have fond memories of SD 1.0. I went on to use it in demos that I did for Apple when they sent me on a multi-city AppleScript training tour. Congratulations for sticking it out despite Apple’s continuous ball-dropping and abandonment, and thanks for all you’ve done for the scripting community! Your question has come up often over the years and a proper and thurough response is a long blog post in its self. I’ve resisted answering publicly because who knows what might have happened had I taken a different path. The problem with the make-it-up-on-volume model is that the market for AppleScript tools is very small and fragmented. I don’t believe that simply lowering the price by 3/4 on its own would generate 4x+ sales volume because I don’t think 4x+ customers ready to buy at $50 exist. I would have to market more to reach those customers that do exist and that costs. I would have to become involved in justifying and marketing AppleScript (as I once was) to create new customers which costs. Then there are the added costs of supporting a 4x+ user community. And finally, it lowers the perceived value of my software. I have developed many spreadsheets trying to model this over the years. Back in the 1.0 days, we aggressively pursued sales volume. We had a lower price then, and signed up as many sales channels as we could. We purcahsed adds in MacTech and MacWorld. Our sales volume steadily rose, but our net revenue started to fall. Thanks for the thoughtful reply. There are still lively AppleScript mailing lists, forums, Twitter streams, etc. with enough active participants that I would expect there to be a viable market at a lower price point. But then I’m sure you’ve given the matter a lot more thought than I ever will. Maybe one of these days I’ll be flush enough to bite the bullet…. Then came Script Debugger 1.0. 20 years and hundreds of thousands of lines of code later I’m still gratefully using Script Debugger (which runs 24/7 on my system). 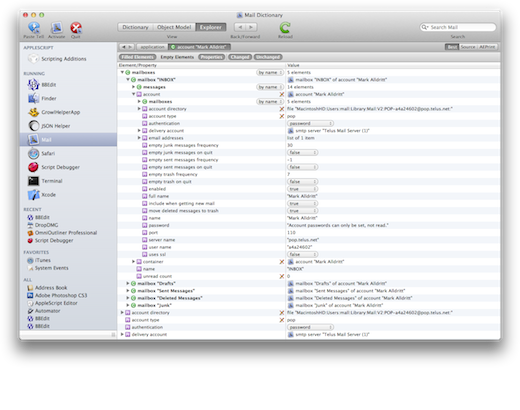 You’re still one of my favorite people in Mac-space. Script Debugger has always been my tool of choice for AppleScript development. Quite why Apple hasn’t offered you a heap of cash for it I have no idea. Great tool and it’s saved me heaps of time over the years. Congratulations! Very cool that the product has been around this long. Thanks for taking the time to tell the Script Debugger story. I’m not a scripter myself, but I thoroughly enjoyed reading it. I’d be interested in reading a post about the technical challenges of the framework transitions you had to make (Think C all the way to Cocoa) too. I too purchased every version of ScriptDebugger ever produced. What a joy the product has been to use over the years. Thank you so much for spending the time and effort developing this essential tool. Without it I would never have attempted to learn AppleScript.